While searching through a variety of different models of garden furniture, it can be easy to lose track of what you like, what you've seen, and what you haven't. If you'd rather speak to someone on the phone about what you're looking for, just pick up the phone. Our friendly team will be glad to help. We listen to your requirements carefully and combine them with our product knowledge to help you find the ideal garden furniture. So call us on 01243 717197 or send us an email. We look forward to hearing from you. Our range of square metal garden tables range from side tables to 8 seater square garden table sets. We have folding tables and extendable tables available too, so there's a practical option available for every individual need. The Lucy table is a 4 seater square garden table set in Antique Bronze. This superb table features a simple lattice design on its 91cm2 table top. The Lucy set's square garden table and chairs are made of cast aluminium, making them robust and weatherproof. The Lucy table can stay outside all year round, and it won't rust or be otherwise damaged by the elements. For a contemporary garden dining table that looks as good in the dining room and conservatory as it does on the patio, try the Lottie table. This practical piece of modern, square garden furniture has an extension mechanism which extends the table from 150cm to 210cm in length. Extended, it seats 6 people. It's made of cast aluminium, and so like the Lucy table it will survive the elements without being damaged. Its accompanying seats are stackable, and made from cast aluminium and a hard wearing outdoor mesh fabric. The Zara bistro set is a square 2 seater garden table set made from steel. The folding bistro table and chairs fold neatly away to save you some space when you don't need to use them. This functional 2 seater square garden furniture comes in black, white, Antique Bronze, and grey. If you need a larger table with greater capacity, we have the Tanya table for 8 people. This cast aluminium garden table features beautiful metalwork on its 162cm2 table top and comes in Antique Bronze or white. You may just be looking for a garden side table. If this is the case, take a look at the Sandra table. Place this 54cm2 table next to barbecues, sun loungers or garden benches as a handy place for your drinks, sunglasses, books etc. Our table sets come with more than one choice of chairs. A default option is always available free of charge, but take a look at the Rose, Kate or Abigail chairs. You might like the look of one of these other options much more. If so, select it for between £5 and £25 per chair. Also if you're purchasing a table and chairs set, you'll have some fantastic offers available to you. Many of our customers accessorise their square garden table set with useful accessories such as a parasol and seat cushions. Underneath the section where you choose your chairs, you’ll find offers for seat cushions and parasols in various colours. Purchasing these accessories alongside your square garden table means you save 70% on them, compared to buying them separately, so don’t miss out! We’ve got other offers too. 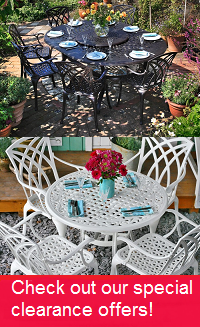 You can get up to 80% off various high quality aluminium patio furniture items such as bistro sets and parasol bases. But these offers are unique to the product page, so combine them with your main order to take advantage. In general, we have some outstanding deals on our clearance page. These deals apply to all kinds of outdoor furniture, from sun loungers to 10 seater tables. They change all the time, so check back regularly, and if you see a bargain, get it while you can! Please take a moment to photograph your new furniture to help us raise money for our Do Some Good charity campaign. Just take a few pictures and share them on Facebook or Instagram with the tag @LazySusanFurniture or email them to us. We then donate £10 for any set of photos of Lazy Susan furniture in your garden. We’ll donate £20 for photos including friends and family during a family lunch or BBQ. Your help goes a long way.